After a fire breached the boiler and plant room of the Séan Kelly Sports Centre back January, much of the mechanical and electrical systems within the building had been left destroyed. The fire began in one of the main boilers and spread throughout the plant room, causing a lot of local damage, luckily the local fire service got to the fire quickly and extinguished the flames. Emergency M&E services were put in place to ensure the building was not out-of-service to the Carrick-On-Suir community for more than one week, however these emergency measures were only short term. Due to the centre’s communal impact on Carrick-On-Suir, Noel Lawler Consulting Engineers were more than happy to be involved in the renovation of the site. Marcus Fitzsimons of Noel Lawler Consulting Engineers was hired as the Mechanical and Electrical Engineer(s) to put in place the new system which should see the Séan Kelly Sports Centre serving the local/Carrick-on-Suir community for many more years to come. As you will see from the before and after pictures (See below), extensive damage was done to the boiler and plant rooms in the building. The main boilers were replaced, heating pumps and piping were also badly damaged and needed replacing with newer versions. The building management system (BMS) was also replaced with new sensors and fire detection equipment fitted, the new BMS system will provide the centre management with significantly better controls. The two CHP (Combined Heat Power) units were largely left undamaged, although associated pipe works and electrics were. Soot was blown from the boiler and plant room through the ventilation to the main swimming pool. 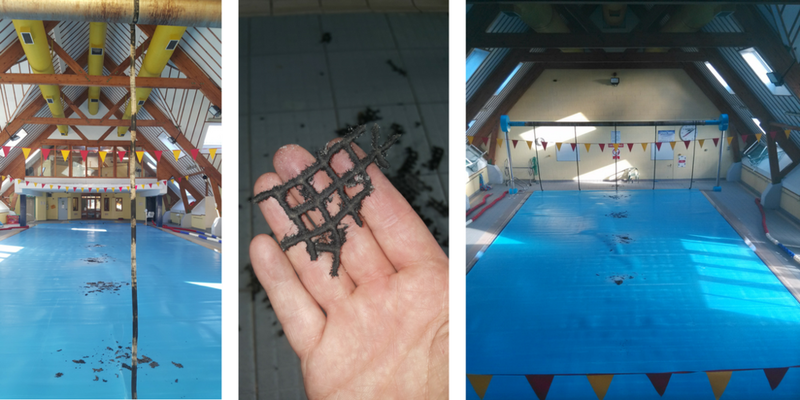 The soot which fell from ceiling ventilation to the main pool area can be seen in the photos below (See below), the ventilation system required a thorough cleaning, access to the ventilation was difficult given the height and the position of the vents above the water. The pool pumps for the main pool needed replacing also, the variable speed drives were replaced and relocated above the main pool pumps (See below). The Centre is often busy at all hours and receives a large number of visitors before and after going to work. The building has long opening hours, opening at 8 a.m and closing at 9:15 p.m, the refurbishment works were carried out while the centre was still running and as a result a minimal amount of disruption to the business occurred. – Pool and Spa Services Ltd.